Inspired by a recent trip to the ancient Roman villa and seaside refuge of Pompeii, Italy, this bedroom serves as a tranquil retreat for special guests of the home. Soothing neutral tones—ivory walls and cream bedding—are juxtaposed with a dramatic red Venetian plaster ceiling. 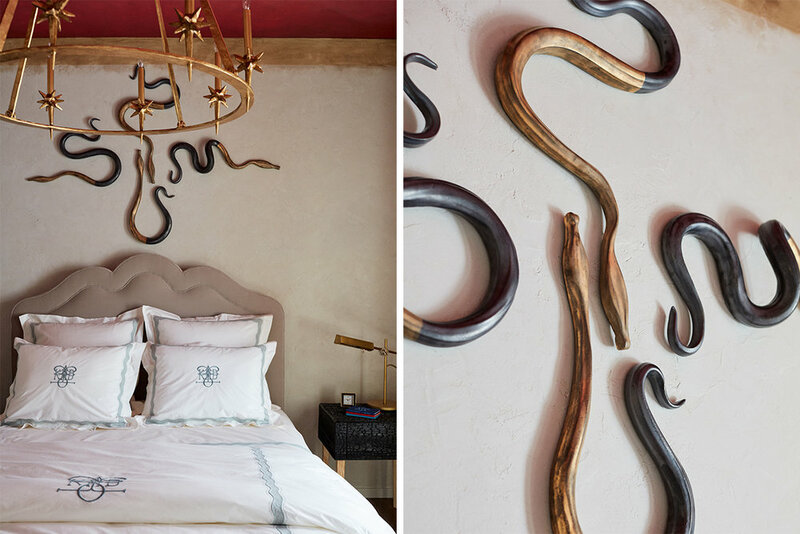 Reminiscent of the ancient empire’s architectural and design prowess, this space is infused with Roman-inspired elements; charred wood nightstands recall the charred beams in the town of Herculaneum and the watchful eyes of ceramic snakes above the bed fend off bad spirits. Tucked inside the closet is the ‘Lararia’, a lavish fresco with vibrant imagery of trees and snakes, believed by Romans to bring abundance and good fortune. For tickets and information about the 2018 San Francisco Decorator Showcase, visit decoratorshowcase.org.